A big thanks to all developers and contributors around this system , I really like it. I work with Krita , Kdenlive ( KDE ) but also Mypaint , Gimp ( GTK ) and it is rare to have a good looking theme across all applications. Linux Mint KDE 14 get it by default , and also propose advanced setup of GTK theming inside KDE. 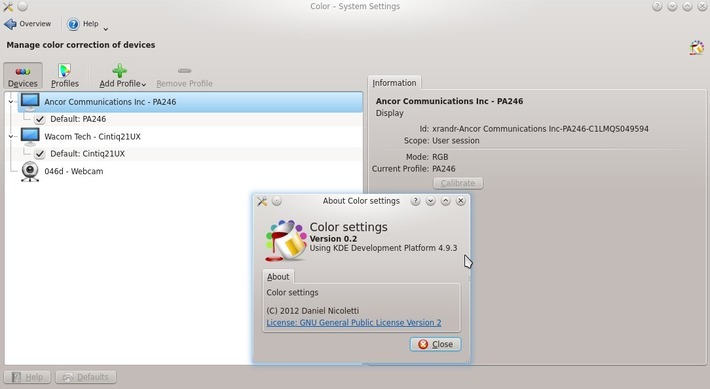 Wacom KDE services are installed by default. 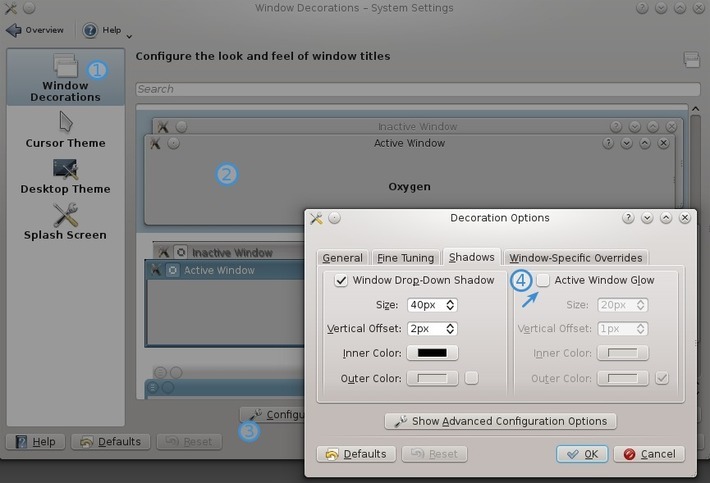 The user interface propose similar option as the Wacom official driver on Windows. Another good default is the presence of the color-management panel. About 3D and display driver, it's possible to see how Kwin ( windows manager of KDE ) is behaving faster than others. Read this article of 6 pages on Phoronix : "Ubuntu Unity Proves Very Slow To KDE, GNOME, Xfce, LXDE "
Also, controversed KDE services like Akonadi and Nepomuk are turned of by default. Here are my notes of 10 things to do after a clean install from the live-DVD. This will boost the time of your system update ; Open your main menu, and in the search file enter 'Software Sources' then follow the picture number ( 1- first tab , 2- Download from 'Other' , 3- Select Best Server ). Linux Mint will find the best server. Note : the install may hang in the middle to ask you to choose for a 'login' software : the choice will be between KDM and LIGHTDM , choose KDM, and click ok.
Go back in the 'Software Sources' , it's on the 4th tab. I advice you to restart your system after a new display driver is installed. For my digital painting tools : Mypaint and Krita , I compile them to have the last version and test features, report bugs ( read at the end of this article for more infos ) . Gimp is already installed. You can install Gmic via the Software Manager. If you don't want unstable digital painting software ; install Krita 2.5 from this Software Manager , and for Mypaint 1.1 use the PPA . I also remove on Dolphin in the 'Behavior' tab the "Show Tooltip" , and in the "Previews" the "Directories". 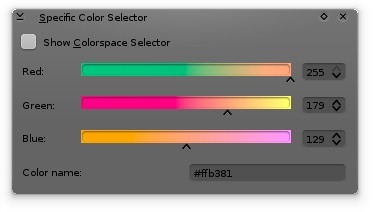 Mypaint icon of the color selector are a bit too big with the default oxygen-GTK setup ; just go in the Setting > Appearance , and set the icon size of the toolbar to 16px to fix the issue. This widget is fantastic ; drag and drop a *.jpg picture on it, and it get automatically hosted on internet, and the link get pasted in your copy/paste memory. Very convenient to send picture link over IRC, or in bug reports. To install it on your desktop, just click a 'cashew' (1) and then click on the button to 'add widget' ( not on the screenshot ) , the widget bar will appear, and you can slide it to find the pastebin widget and drag and drop it on your desktop. KDE desktop have a cool feature named 'activities' ; you can have the activities switcher by doing the same than for having the previous 'paste-bin' , but just drag and drop it at the end on your panel. When Mypaint, Gimp or Krita are out of focus ; the default behavior is to hide floating windows ( palette / brushes / etc... ). If you dislike it, you can desactivate it in System Settings > Windows Behavior and uncheck the checker box ' Hide utility windows for inactive applications' . When a windows produce a "child dialog" ( a pop-up , as in the previous image ) , the background ( or parent ) windows is greyed. This is an effect named 'Dialog Parend' . To remove it , System Settings > Desktop Effects > Then all effects tab , and scroll down to find Dialog Parent to remove. This one is really well hidden : you have to open via a terminal 'oxygen-settings' to open the dialog. A secret dialog. In it , you can change the annoying behavior of having the whole windows moving just after dragging by mistake ( or a mis-click , happen a lot with stylus ) on the GUI. Changing it to 'draging window from titlebar only' make sens. There is no official support, but I'll do the best to answer questions in the comment. License: CC-BY David Revoy, www.davidrevoy.com, 8 january 2013 . Thank-you for going to this effort every year or so. I cannot imagine how much time it must take to seriously evaluate each of the options. The updated documentation you provide each time on building/using latest versions of each of the packages is a great example for the rest of us involved in open-source software. Your contributions are fantastic, so, again, my thanks. Thanks david for taking the time to share this review. Merci David pour tes efforts , explications claires simples comme on en trouve pas forcément beaucoups sur la toile pour un néophyte comme moi, ( bon j'ai quand même fait plusieurs installation de distribution mais...).Donc prochainement je me lance dans mint KDE14 et je te dis si tout est ok. Thank you very much for this guide David. Thanks to the last guide I switched to Kubuntu and now I find it hard to try other DEs with less configurable options. On a sidenote, have you ever tried any dock in KDE? I've been using the Icon-only Task Manager, and while it's good, I'd love to have a more feature rich dock that shows the icons of every program I use (I've been having a problem with Blender showing only an X while I'm using it, even if I have a menu entry for it). Have you tried any of them? Tu gères ta race grave! Thanks for the notes David, really helpful. Unfortunately I too have been of the impression till now that KDE was a heavy system, but after reading this I will try out KDE sometime. One more question. You frequently switch operating systems and I believe you do a completeley fresh install right? That means you have partitions in your hardrive one for your OS and others for your own files and wipe out only that partition for your OS right? Or do you back up everything and then install and restore? I use Debian and Xfce only, but even in this case this information very interesting for me, thanks! @Saverio : Kubuntu is also a nice distribution, in KDE 'buntu based there is also Netrunner , very good. All the 3 project (Kubuntu/LinuxMintKDE/NetRunner) are sponsored by Blue System , and benefit from common evolution and sponsored work position to make KDE really polished on the top of the 'buntu packages. @Malcolm Tredinnick : Thank you , it does indeed take a bit of time to study. But my geek curiosity make it looking like a good adventure. @bittler : J'éspère que la transition à KDE se passera bien. Le system est très souple et n'importe quel comportement propose des options de préférences. De plus , KDE est bien traduit en français. J'éspère aussi que la transition de Gimp-painter à Krita ne sera pas trop difficile. Depuis le centre logicielle, Krita est en version 2.5.3 , ce qui est pas mal et à déjà tout pour plaire sur une bonne machine. La 2.6 apporte toutes les performances et va finir ces prochains jours ; un 'PPA' devrait suivre , je le mettrais sur mon blog aussitôt. @Raphael Barros : Yes, I tested pretty docks by the past on Gnome, Docky and AWN. But I didn't use them now. The KDE panel are also enough flexible to be set as almost any dockers I would need , watch this tuto : http://youtu.be/LtE3XlloLxU. @Mishrito : Hey Mishrito. In fact, yes, I do fresh install every time , because I like the stability of new fresh stuff, and also discover the new default settings. I backup all my /home data daily (around 40GB) with a rsync command and a custom script on a external hard-drive ( only the new files are copied , the backup are fast ). When I install a new system , I have my /home on a different partition ( I don't format it during install, I just say 'use this partition as a EXT4 , and /home partition in the manual partitioning tool ) . On the live CD, before install, I rename my user name from /home/deevad to /home/deevad-old , then install the new system with 'deevad' as a new user name. When all is installed, I just migrate from /home/deevad-old to /home/deevad my data ( moving is fast , because on same disk ). I also copy some of the pref / config file I need : ~/.mypaint , ~/.gimp2.8 , ~/.kde/share/apps/krita , ~/.mozilla , etc..., etc ... Really easy and fast migration. And when I move files, I always take care to do a cleanup at the same time. @kot-barbos : I tested a Debian + Xfce , definitely a good mix. With 4.10 , I even kept Xfce during more than 2 weeks installed on December on my workstation ( It was by then Linux Mint XFCE 14 ). Also, XFCE on my laptop . Open raster thumbnails (with a plugin) , good dual screen management for task manager, snapy speed for launching everything, and even a file renamer and a simple compositing to have drop shadow Windows. XFCE was my first desktop environment distribution , 4 years ago , and I have a lot of affection for this DE. ( on one of the first Linux Mints ). On the few point I disliked : no GUI for Cintiq calibration, and doing it via CLI is a torture ( I did it too often). Hard management of the theme ; KDE + GTK2 + GTK3.2 3.4 3.8 mess ; only few theme perform quite well, Mint-X and GreyBird. 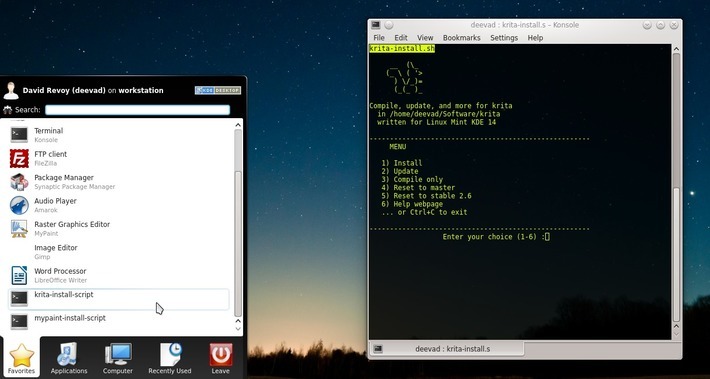 So, thanks to God, linux users have a choise, and each user chooses what he wants. @kot-barbos : That is exactly what "Free Software" is all about isn't it? Freedom of choice and freedom to use. And I'm glad something like this exists. @Mishrito: Yes, "Free (Libre) Software" - it's freedom of choice and freedom to use. But also, it is - responsobility, I think. If you can help, do it. Redistribute, share, help install and customize, give advice for the newbie, donate to the developers, etc...In a world of money and restrictions it's like fresh air to the simple users. @Mishrito : You may consider the usage of a program as backintime for using a nice GUI and rsync. My short rsync script is here : http://pastebin.com/raw.php?i=kc9PJ38p if you want to have a look at it , but I'm affraid you'll have to customize all the path to make it work for you. The script ask a question at start, a full backup ( all /home with pref, all data ) , or a short one ( my subfolder with active daily painting work, named 'atelier' ) and copy it to backup-mirroir on my HDD. The script also manage to copy a txt file with the date and the log of the backup... It's very specific and finally perform only a copy. Backintime is a bit more complete, and I'll probably move to it soon. @David REVOY : Thanks for the script. I though it was bash but rsync looks good too. Backintime looks like a nice frontend to rsync which is convenient. And yes I'll adjust it to my filepaths. I am just worried about one thing though; does rsync add it's own metadata to files? I wouldn't actually want that. @kot-barbos : Ah yes I agree. I'm always going around trying to spread the Linux Love. And I use FOSS for everything except Gaming. I file bug reports when necessary and keep trying to use dev versions when a binary is available. BTW is there something like a complete "Guide to compiling" lying around somewhere on the internet; because it seems I fail at compiling most of the time. 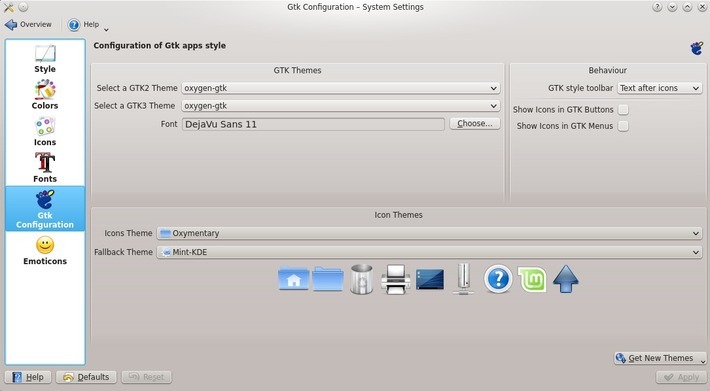 could you share us which KDE settings (appearance,theme) are you using and also FONTS.. I see from your screenshot that your krita, for example, is very smooth..
hey... does anybody know if the Graphic tablet settings works with non-wacom tablets ?? ...and... is there any big difference between this KDE mint and Kubuntu ?? 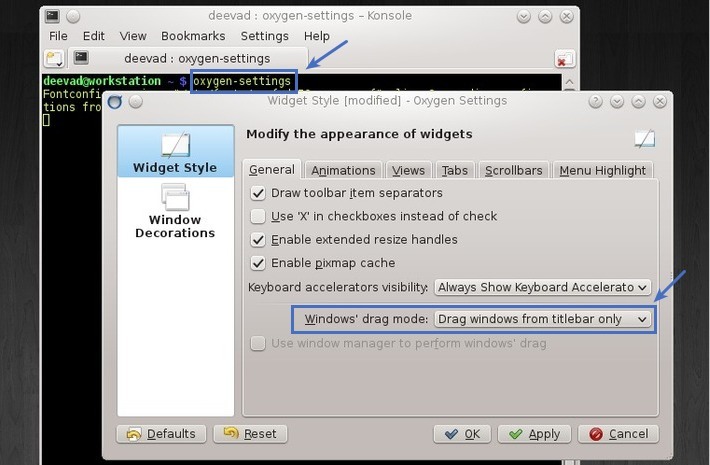 @Riccardo Bocci : Hey, I use all the default of the Linux Mint KDE team for the theme : here is a screenshot of the font panel : http://img28.imageshack.us/img28/6506/selection020.jpg ; the theme and color are both 'oxygen' , I also use oxygen or caledonia as a desktop theme for Plasma. 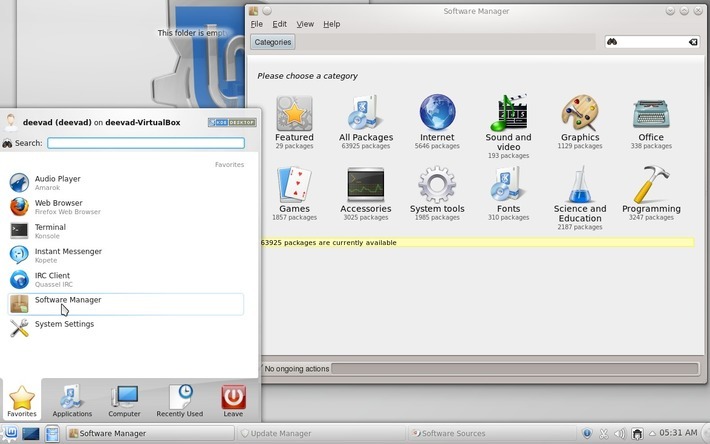 @santiago : In fact Kubuntu and Linux Mint 14 KDE are really similar ( and Netrunner too ). My problem with Kubuntu, is with the name of the distribution : it's not really a KDE version of Ubuntu, Canonical even dropped their own support to Kubuntu ( even if the KDE desktop can 'emulate' a Unity interface easily ) . I find it confusing, and old fashioned for the 'K' prefix in front. For Linux Mint, they always kept consistent the bottom bar, the start menu , the way to handle the file browser ( double click, simple bookmark ) and this consistency can be seen across all the flavor of their distribution. That's why I think it's a good project to support. ( + the mint backup tool, the mint logo, and in a way , I like to have the word 'Linux' in the name of my distribution ). About the tablet ; I ignore how it's behave with non-wacom. But it could be checked with a Live-CD easily. Thanks for the scripts. :) The myPaint one works perfectly for me. Unfortunately the Krita one doesn't. It seems to compile fine, but after I restart Mint still doesn't recognize Krita as an installed app. I tried to run kbuildsycoca4 to manually update it but it didn't seem to make a difference. 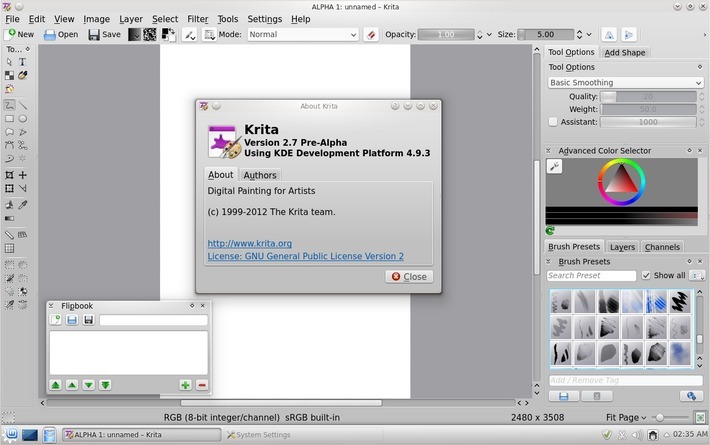 KDEInit could not launch 'krita': Could not find 'krita' executable. krita(9289)/koffice (lib komain): "krita" part.desktop not found. krita(9289)/koffice (lib komain): Run 'kde4-config --path services' to see which directories were searched, assuming kde startup had the same environment as your current shell. I couldn't find /etc/kderc/ but /etc/kde4rc does exist. How should I proceed? Sorry to hear it wasn't a pure working experience for you. 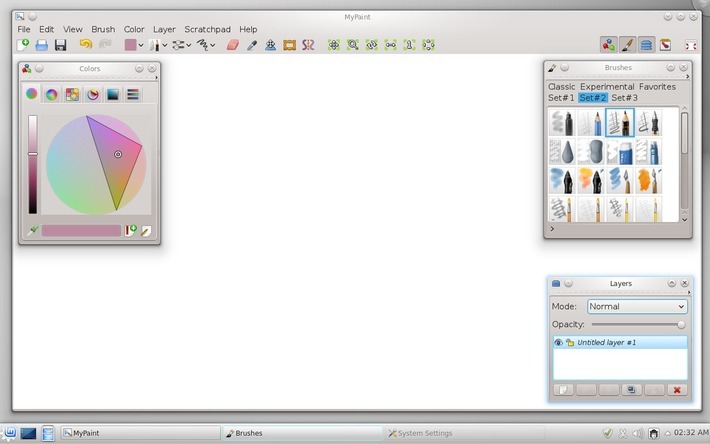 1. run 'synaptic' ( Menu > Computer > Synaptic package manager ) and remove manually all package installed with a name with : krita / calligra ... In fact previous Krita installation or calligra-base package , can do an issue. I think the most difficult is to understand what packages needed to finish compiling (./configure tells to you that info but for me not allways that info is clear). Then I saved, and restarted. Now it shows up in the application menu and launches just fine. :D I think my issue must just have been a fluke but hopefully that info is helpful to anyone with the same issue. @rsek : nice if its working, thanks for sharing the solution ! Normally the script add automatically this prefix lines to a file names '.profile' in home directory. but for sure I don't know how behaves the script if '.profile' is not created. Are you in Linux Mint KDE 14 ? or another flavor of Mint ? cette fois-ci tu m'as convaincu, je suis passé d'Ubuntu à Linux Mint KDE. Par contre, un gros point me gène. Pas moyen de paramétrer les touches de ma tablette (Intuos 3). J'ai beau assigner un raccourci pour une touche (CTRL,+ par ex), elle reste sur le raccourci par défaut. @Tepee : Cool ! Ca fait plaisir de savoir que ça marche bien en mode 'dock' aussi. 2. Redemarrer ; ainsi KDE s'occupera plus de la tablette. 4. Dans le panneau de préferences et configuration de KDE, pour le lancement/démarrage , indiquer le script à faire démarrer. Bon, c'est un peu plus barbarre, et demande une petite heure d'experimentation et fait grincer des dents à scripter, mais ça marche à tout les coups les commandes xsetwacom. Bon courage ! xsetwacom set "$PAD" Button 9 "key a"
xsetwacom set "$PAD" Button 10 "key b"
xsetwacom set "$PAD" Button 11 "key c"
xsetwacom set "$PAD" Button 12 "key d"
@David Revoy - yes, I am using Mint KDE 14. The installation itself is only about a week old but my /home/ folder pre-dates that by a few months. It's possible some variable got changed somewhere along the line and caused the problem. Thanks, but "kfilebox" doesn't work. merci pour ton script avec xsetwacom, cela m'a permit de découvrir que quand j'assigne la touche +, et bien c'est le = qui est utilisé... J'ai indiqué shift plus, et ça marche (encore mieux quand je me suis rappelé qu'il fallait que je le passe en exécutable, la honte) ! Du coup, j'ai récupéré l'usage des boutons tactiles (strip) car sous Ubuntu, je pense que j'avais le même soucis vu qu'ils ont toujours refusé de correctement marcher en zoom+. Funny that we don't care about it (me too the first time). @Tepee : Super ! Oui je crois que xsetwacom se perd un peu entre le layout de clavier FR et US :) Ca me l'a fait a des fois. Super d'entendre que ça marche bien. Hi thanks for the excellent guide much appreciated. @kot-barbos : oh, I'm curious to know your global feeling about it coming from Debian after a week or so of usage. You are right ; ppa + ubuntu one + steam ( I still need to install it, I was an invited beta tester, but didn't had time )... good services. I jsut purchased a brand new Lenovo Thinkpad and installed Mint KDE 14 on it. Everythign went smooth and exactly as you said except for one thing. 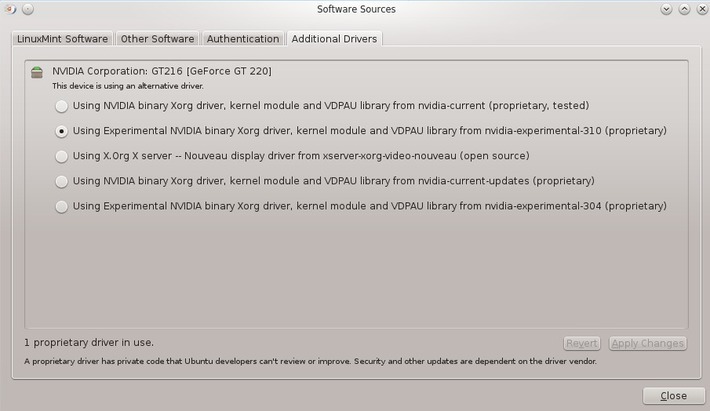 When choosing the nvidia driver I chose the one you show in the screen shot through the Additional Drivers gui. Its listed as being the 310 driver as you show. It downloads and seems to activate. I reboot. I check. The Additional Drivers dialogue says: "driver is activated but not in use". @David: of course I'll post my feelings after some days here. Thanks to God, all my config and scripts located at /home, so I even would not notice the difference, i think. @Another David: what model of ThinkPad you have? Different models have a different graphics, maybee yours one have a hybrid graphic with integrated Intel. Try to search in this directoin. @Andre : Weird, normally this dependency is installed using the option (1) Install. Its line 47 in the script who take care about it. Thanks for reporting ! It may help other. @David : I don't have any idea. Probably try to update the system, and retry. Also, your card may prefer an older version than the 3.10 ; you can try other. Then , if things are still wrong, look if there is a issue listed about it on the various Mint/Ubuntu forums and website. Good luck ! kbuildsycoca4(11825) parseLayoutNode: The menu spec file contains a Layout or DefaultLayout tag without the mandatory Merge tag inside. Please fix your file. kbuildsycoca4(11825) KConfigGroup::readXdgListEntry: List entry application/csv in "/home/XY/.local/share/applications/mimeapps.list" is not compliant with XDG standard (missing trailing semicolon). Had to switch back to Discrete Mode in the BIOS for the display. Wow I was ready to pull my hair out. Here is the wonderful post that suggested the fix. For anyone else who stumbles into this wall. @Andre : kbuildsycoca4 just update the icon , and sometime there is error ( I have them also ) ; but those are minor. If your Krita run, it's ok.
VC and myPaint worked perfectly. However Krita is being a pain. I followed your suggestions above for removing all instances of krita and calligra and then the krita folder in Software. I tried a resinstall. The script seems to grab everything. And everything is in the krita folder: src, inst and build. But it doesnt seem to be installed. I can run krita from command line and it says command not found. After the a restart this line propagate, and normally Krita can get launched. and sorry if it's a way with issue. 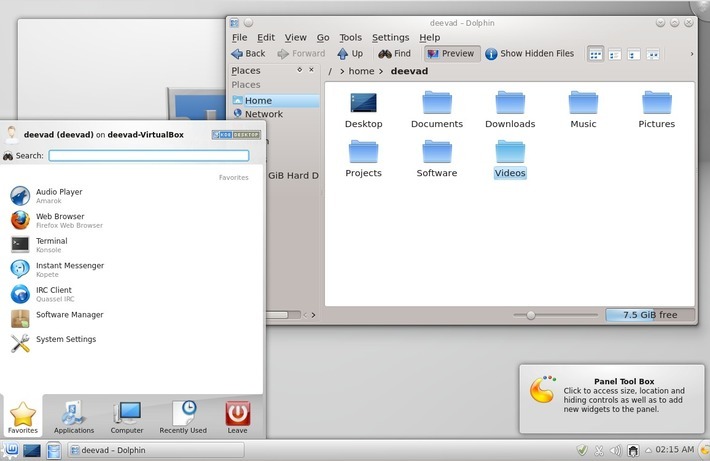 I promise I tested the script on 3 virtualbox LinuxMint KDE 14 updated ; and get good result. Those lines were in my .profile multiple times. I fixed that and rebooted. With this informations, I'll see what's going wrong with this install. Thanks in advance! i'm sure it can be fixed. It's certainly a dependencies... missing. I suspect the repository deb-src again. I could see the error is in the build, but I had difficulties to know what happen : libGL is in cause, but the configuration said libGL is found. Certainly related to your Gfx driver particular setup. [14:13] deevad: neither, is it on ubuntu ? [14:15] many thanks CyrilleB , I'll advice this. - 1) check if the 2 lines from your ~/.profile are here, don't clean them. Thanks for checking with the devs David. However Im told that the mesa-dev package is already installed and at current version. So just for the heck of it I installed Krita from Synaptic. It works. Version 2.5.3 I think. So now im running the script. According to specs it wil uninstall this version and replace it correct? Lets see what happens. Krita 2.5.3 from repo will install into your /usr/bin via the package , and so may also add dependencies relative to this version. My script have at line 67 : sudo apt-get purge krita* koffice* karbon* calligra* , to remove all package related to Krita or Calligra ; because the two install can't really co-exist or affect a lot of bug. - 4) The 5 february ( in around 2 big weeks ) Krita 2.6 will be released and be on package too , so not a long time to wait. Sorry if you had trouble with Krita compilation, but somehow your configuration doesn't behave as a casual Mint KDE 14 I test threw my system/laptop or vitualbox, so I can't help. Probably if you want to go further, feel free to join #krita channel IRC on freenode and chat with user and dev on it. Funny thing....the script didnt uninstall my copy of Krita. @David : hehe :) I understand totally. (l.1102) : make: *** No rule to make target `/usr/lib/x86_64-linux-gnu/libGL.so', needed by `lib/libflake.so.12.0.0'. Stop. (l.1282) : make: *** No rule to make target `/usr/lib/x86_64-linux-gnu/libGL.so', needed by `lib/libflake.so.12.0.0'. Stop. Something happen with your video card driver, and OpenGL, imo. It might worth to try compiling with another proprietary driver. Or trying to inspect whats going on here. Stumbled upon your Owl Princess time lapse video and was completely mesmerised by the process and the artwork. Wow, your mastery over painting *and* the technical tools you use are breathtaking and inspiring! @WP Ho : hey thanks WP Ho for passing and let a comment :) thats encouraging. As you can read on the previous comments, to have the last tool and top-notch feature can reveal to be a little pain ... but I hope it's not discouraging too much , when its installed, it runs like a charm. Both greps came back with relatively same info barring name of card. libGL.so is also in the appropriate folder the script is looking for. PS: Can't wait for new tutorials! @Riccardo Bocci : Oh nice you have a good experience. For the moment Git master have 2 main issue in my opinion : slow and buggy tranform tools ( but already well developped on a branch for the fix, incoming soon in master ) , and slow openGL for some Gfx card ( maybe solved today ). If you want more infos , have a look at the last list of bugs . Well...just reporting in David. I finally managed ot get the script to work. I got rid of he libGL1.so and re-installed it. Removed the Software folder and ran the scripts all over again. Krita built without a problem and I am now looking forward to your setup tutorial! I have been following you for couple of years now and I wonder one thing. Why do you keep jumping from Mint to Kubuntu and vice versa. It seems that after every 6 month you always go trough testing 5 or so different distribution with KDE and the ending in Kubuntu or in Mint. What is it that you really is test in them? I can't understand why you just don't build yourself a solid Arch Linux setup with KDE and stick with it? I believe that you can manage with Arch's installation since it seems that you are very familiar how to tweek and setup a Linux distribution. Also there is such thing like ArchBang with easier installation start to Arch Linux world. @Konstantin Nikkari : hey, Thanks for following ! And thanks for the interesting question. I always try to propose the easiest Linux painting solution for my followers. In fact, as you said, I'm enough familiar on how to tweak and setup a Linux distribution to stick to Arch , for ex. But, I don't want to adopt a selfish behavior, and promote a solution most of my blog audience couldn't adopt : that wouldn't be fair. How many tweaks before start getting painting ? How easy it was to install ? Flash, proprietary driver ? Wacom GUI ? LiveCD to test ? Can I paint smoothly ? Can Blender 3D viewport run smoothly ? Can I screenrecord while painting ? stability VS update : a good compromise to find. What package works or are broken. Linux Mint KDE 14 , offer this simple 'out-of-the-box' experience ; with a mix of good performances, default setting, configuration via a GUI and default applications. I can deploy it in a single afternoon. And in a prod using a full afternoon for setting the tool is already a lot for an artist position...I believe with my guides made of pictures, graphic user interface settings , I help artists around to profit about the easy side of Linux, and avoid hours of testing so many broken or half working distributions. By the past and from my test, Linux Mint 9 ( Gnome 2 based ) then Kubuntu 11.10 made the better distributions according my three test. Thats why I adviced them at this time. @David : Good news and congratz ! it was a long quest to get it work on your system. :) About the tutorial , I'm late, still on the to-do list. A time ! I want more! Download, chmod +x, run and follow instructions. Is there any way of getting HSV sliders in krita (to choose colors)? @slug45 : oh oh, good tip. I would be affraid to break plymouth just to get a good looking 'Linux Mint' logo at startup ; but :D I'll try it. >> Is there any way of getting HSV sliders in krita (to choose colors)? Yes, on the actual Krita Git Master ( 2.7pre-alpha ) in Filter > Adjust > HSV adjustment ( also has 'colorize' ) . So, I end my challenge. The challenchers are: Xubuntu 12.10, Mint 14, Xubuntu 12.04. And the winner is........Xubuntu 12.04! It was a quite difficult challenge, I must say. The main difficult was that the all *buntu's distro has a ton of apps don't needed to me. So many, that cleaning the system consumes much more time than installing one. I must admit that for me it's was a boring, in the same time it is wery good for the newbies in the linux. 12.04 was choosen because of much more stability of the system and apps. @kot-barbos : Thanks for the feedback and good choice : XFCE is nice, and the package/update of ubuntu LTS are really solid and not old yet ( With the Ppa to update it to Xfce 4.10 ). @David: yeah, i thought aboui it (Xfce 4.10), but 4.8 good enought for me, so I stayed on it (I have tried it on 12.10), but in future maybee I'll upgrade. LTS is very good for those who wants stability (me), but in the same time ppas makes the system fresh as you said (big win of ubuntu). So now 12.04 is my main system. It has good performance and stability like my debian/testing but much more fresh software and capability. I tried the plymouth script in 4-5 different installations with no problems (all ubuntu based). Thanks David. "Bug" reported :P .
Can you make a tutorial about color calibration in linux? i didn't understand that part in this tutorial..
have you ever tried "kubuntu-low-fat-settings" package? This package reduce memory usage as well as speed up KDE's loading time by as much as 33% and 35% respectively. I'm using Linux Mint KDE 14 on a macbook pro early 2010 and this is very usefull to improve system performance expecially with Blender! Anyway this is a quick cookie! @MarcPag : Thanks for the quick cookie, (miam) good tip ! I will install and try to get more infos about the change made by the package kubuntu-low-fat-settings , it sound promising. Thank you very much. I have had a heck of a time setting up Ubuntu 12.10 to work with my Nvidia card and changing the "alt" key behavior. I installed Mint Linux KDE and it's wonderful. Thank you for the Scripts as well. One question though. After installing the scripts does krita/mypaint automatically update when a new version is out? Or do we just run the script again? I'm new to Linux so I'm not sure what type of maintenance is required regarding updates. @jcue : Hi ! Nice to hear you had a good experience so far ! About the script , yes, you need to run them when you want to update the source. For Krita, the source change everyday , so it's advised to update it ( menu, option 'Update' ) : for example , 2 days ago the important feature of Textured brush reached the source. There is also little bugs here and there who happen. One is about the slow loading of texture and sometime missing one. @David Revoy: Thank you for the response. I will make sure to update the scripts regularly. Knowing that this needs to be done I realize how nice it is to have them. ...that's all. It might be different with other graphic cards, I have a gts-450. ..and I've been using them since the 310 version without problems (althrough it doesn't mean you'll have the same luck) with 3d/2d/wine/hd video.... I don't use KDE or any other composition enabled desktop, I just love how easy, light, simple and fast openbox is. If you have the time and the will, you can always make a backup of your system with something like clonezilla for the OS and rsync or similar for /home and data. @slug45 : Yep, here too I deactivated composition because of a bug https://bugs.kde.org/show_bug.cgi?id=313795 ( one of the good thing with Kwin , it can also works 2D and keep the 'placement' feature ; dragging windows to screen edge propose a resize to 1/4 or 1/2 of the screen. I'm pretty addict to the 1/4 , and other D.E. propose generally only 1/2 ). Yeah, me too. I use a script I made and easystroke for that. The nice thing this way is you don't have to drag the window all the way to the side you want it to be, just do a gesture and it goes there (usefull when you have a 2k monitor or so), and well, you can do a lot more things than just tiling windows, like running programs, scripts, etc just with a simple gesture. I also found out disabling window effects is better, it looks like everything runs far more faster this way and you'll always get better performance without composition (until wayland gets standarized). I use 1/2 and 1/4 moving/resizing a lot and well, using wmctrl you just can do anything you want. Thank you for this post. I'm a hopeless distro-hopper, tinkerer and amateur digital painter, a combination which often leaves me with an unusable set of half-configured and/or broken software tools. I really like your no-nonsense approach. I'm downloading Mint KDE right now, will try to duplicate your setup on a separate partition and see how it works for me. Cheers! Thanks for this David, I've just finished installing all of this and it works brilliantly, Krita's performance under Mint KDE is amazing compared to Ubuntu 12.10 standard. GIMP 2.8.4 brush is still a bit laggy however. @okr & @Cluly :Thanks for the feedback ! Also a tiny tip I didn't wrote : to win a extra tiny bit of performances, it's sometime usefull to turn off composition ( Alt + Shift + F12 ) for a pure 2D mode. Some 3D games and apps like it. David, I tried out your setup. It works more or less fine, once I installed Nvidia proprietary drivers (hoped to avoid this point but Krita kept crashing). My one big question after reading this and other of your posts (like "Ergonomic of Graphics tablets"): What is your keyboard/tablet shortcuts setup now? I tried to set up my tablet buttons as I like them in the KDE tablet config screen but many keypresses (like Space or [ and ] keys) don't work. Also, there are differences in keyboard setup in Krita and Mypaint (like zooming, brush size, undo, brush tool). How do you handle all this? I know you use keyboard while painting, so do you just remember all the shortcuts for every program you use, or do you unify them somehow? Also, if you have some custom shortcuts setup for painting that you could post online, I'd be grateful. About the variety of shortcut, I have a similar layout. I was (and still am) on a fence when it comes to bothering the devs about my problems. I own a regular Intuos 4M that can be easily (..well, sort of) configured with Christophs tools ( http://braindump.kargulus.de/?p=432 ). Can't see how this shouldn't work on a fresh OS with the GUI config tools. Also, the KDE tablet config app seems to work OK (it reads the keypresses and saves them) but the apps (Krita or MyPaint for instance) don't use some of the keys. 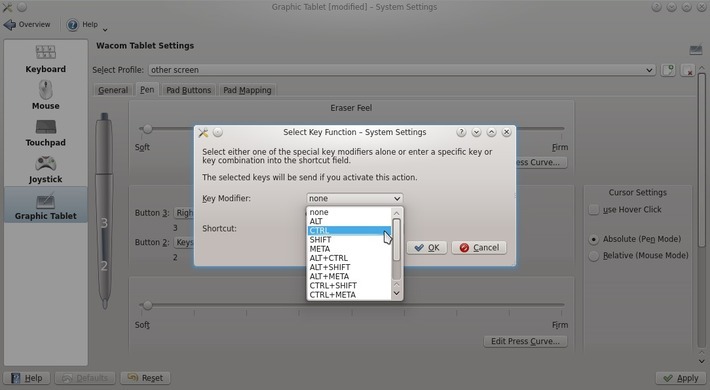 Example: I can set up "CTRL+Z" as a keypress in KDE tablet settings and it works in Krita. I can also assign "Space" as a keypress for grabbing, but it won't work in Krita. It's all a bit too vague for me still, but I'm doing my best trying to find what doesn't work precisely. @okr : Oh, ok ; I see. So the problem is about < space > . This is a specific problem and happen in every Wacom drivers : in fact each button simulate a key preset on keyboard 'once' ; so a single Space. I'm sure your < space > shortcut works in a text-editor and insert a single space. For painting apps like Mypaint or Krita ; the space bar simulate a 'middle mouse click' button , so not really a < space > . It crashed in the middle of installing the updates by the way. Now that i start the update manager, it says that " another application is using apt in the down part of the window, and i cannot continue to make the updates. Funky ! @yoann : Hi, I understand your frustration. Your 3 messages express it well. It maybe related to your hardware ( CG gfX card driver ) or your installation ( do you use old user preferences ? or clean install ) . In any case, writting this here is like whispering in a canyon : you have better luck to solve your issue on Linux Mint forum providing more infos , or directly on KDE or on Launchpad. Bug reporting will ensure your issue to be fixed soon. Good luck ! Hi David ! I seem to have fixed it with a simple restart, and hope it won't come back again. I am now trying to figure out how to use my intuos 5 tablet as a left handed, i have to reverse all the mapping and have to figure out how =). @yoann : Hey, nice and thanks for the feedback about the resolution of your problem. After some tweaks, i have everything working and stable ! Thanks for all the great advices! there i change desktop icon size to 128, but it has no effect... my shortcuts for mypaint and krita remain at the same size. 1) Plasma widget if your desktop is managed only by plasma ( Right click > default desktop setting > default desktop Layout ) , in this case right click on desktop Unlock widget , move mouse over them , then resize on the sliding menu option appearing on mouse over. 2) Konqueror, if the desktop is set to be Folder view ( Right click > Folder view desktop setting > Folder view Layout ) , on the 'Display' tab on the left column, you have a 'Size slider' for all your desktop icon inside the Folder view. Thanks for all that and keep up the good work ! Awesome scripts David! Finally I was able to compile Krita again :D.
But I have one question: before that I could acess the Quick Acess Wheel using the RMB (from tablet's stylus), but now it just turns my Brush Tool into a normal cursor. Is it a bug, or has the shortcut changed? (I tried to look for it on the shortcut menu, but couldn't find). Thanks for all the useful info. I think I'll stick with Mint Kde for a long time in the forseeable future I tried Kubuntu for a bit but Mint KDE is a bit more polished. I have tried out your scripts the Mypaint and Krita ones work well for me but the VC one does not work due to being denied access to clone the scource from Gitorius. I can clone into git repos fine just not Gitorius. Hi David, I have a question about using the "backports" for installing Krita. Do you know if the system becomes unstable or there isn't a problem a bout using this metod?, I'm using Linux Mint 13 KDE too. The script for install Krita doesn't work for me, it shows me a lot of errors, something about the version of qt and another things. @Yoann : I wish you a lot of patience :) yes, KDE offer a lot of choice and is really versatile. @Raphael Barros : Oh, thats sound like a bug. You probably have to report this RMB problem. Here I'm not testing it as I don't use this palette. ( just tested , it works here ) . Maybe related to OpenGL canvas and particular CGcard. Dev will guide you better. @José Ramírez : Ho, too bad for the script. Yes, about Kubuntu 'backport' I used it in the past and it wasn't really stable in my opinion ( probably stable on Kubuntu, but make conflict on LM.KDE ) . All package sent into this ppa are stable, but the mix they do is not really tested. "Did not find Boost. Boost is required for the core libraries, stage, sheets and krita." first of all I would like to thank you for this guide (and the site)! Is it possible to configure the system that is set up for two tablets? I'm using an Intuos 3, but would like to use the PL510 (the 15" inch cintiq) for drawings. It doesn't have to be a dualscreen: a way to toggle the displays would be very useful. The thing is that the linuxwacom wiki is swamped with so many troubleshooters and guides that I just don't know where to start. There could be no simple solution that solves all, but it's hard for me to narrow it down with basic knowledge of linux. Could something like your instructions work for 2 tablets? Thank you for your time and keep it up! @José Ramírez : Ho cool you found how to build it. 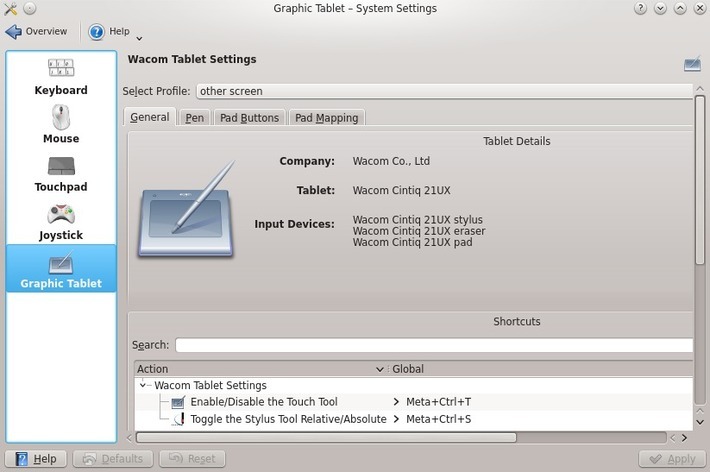 For sure you can set both tablet, but you'll need to uninstall the part of KDE who manage the Wacom ( remove package kde-wacom-tablet in Synaptic ); then configure both your tablet via a script who load xsetwacom + option. On my guide for Linux Mint 11, wacom part , yes, I explain how to assign a tablet to a single screen ( version for Nvidia proprietary driver ). Also the wiki of the Linux Wacom project is well made about knowing more xsetwacom. It takes time, but then you can be independant with your 2 tablets. This is a very hard case : no developper got this sort of hardware , so its need a lot of tweak and knowledge to make them working. Heh, I've never noticed any jitter before. Because the lack of space on my desk I would swap the tablets around when I wanted to work on the cintiq. After some trial and error with the math, I've managed to configure both tablets. @Tristan : Really cool , good job with it ( I know it's not evident to handle now. 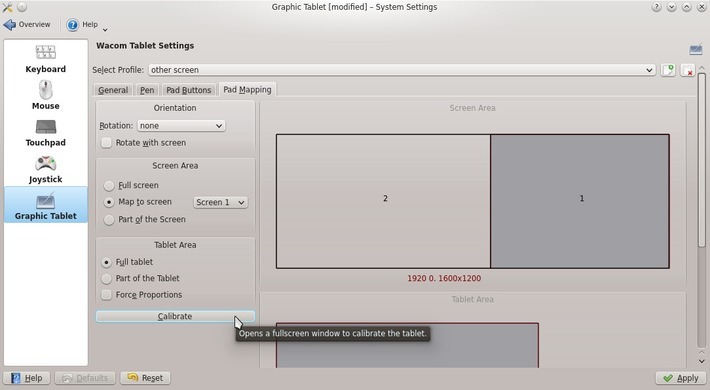 next Kde-wacom-tabet will have a 'switch' screen option, but for sure still no way to handle 2 tablet ^^ ) , thanks for the feedback. Thanks for the tips and especially for Krita. I didn't know that app before. Do you know any sites that have a listing for Linux apps as I couldn't find one except in wiki. Even then, the list there is not complete (most for gnome not KDE). @erie88 :Thanks for the feedback about my guide, I think the best is to open the 'Software Manager' in the main menu, and discover the app here. There is also on the app page a link to the main website to learn more about and comments of users. Also, you can install Gnome apps on your KDE distrib without any problems. @Panos : hey Congratz for getting all installed ; it's a lot of work. Also thanks for the feedback on my artworks. About the software ; I use the three, because I know each ones by heart and sometime on does a single feature better than the other. But nowadays ; with recent Krita development , things start to change : Krita can more and more be a lonely tool to make painting from scratch to finish. ( for info : I used Gimp for my end compositing and filters , not paint because brush is slow, and UI for brush config is not ergonomic ; for Mypaint , I liked the lightweight and 'feeling' of it simple brush system , I keep it to only 'draw' or sketch nowaday ) . So , I advice Krita. It's a very healthy project with a lot of update too. Good continuation. Thanks so much for this writeup. I'm an active Kubuntu user and I learned a few new things by this writeup. What a very nice topic but I also want to share to all of you about the painters in san diego that having a good servies like Full service painting Commercial and Residential specializing in custom interiors,Decorative moulding installation-Crown mouldings, baseboards, doors and case mouldings, chair rails, and more,Faux finishing,Color consultation,Drywall repair and texture matching,Cabinet and door refinishing,Deck Restoration.So what are you waiting for grab this opportunity now!!! And this repository is maintained by a Krita developper, I didn't tested it. If you do, report them your experience, and if the package installed correctly. That's what I would recommend. Good luck with it! Thanks a lot for the info my friend! I will sure test that distro and your tips and see how that goes. It's just that I got fed up with all the licensing hassle and whatnot. But anyways, I appreciate your time and advice. Hope I can get up and running quick enough hehe. Take care mate!